Where are you all!? It’s so quiet on the lake in front of our house… usually the Canada Day long weekend is much busier than this…. maybe people didn’t get Monday off so it’s not really a long weekend? Today is the first day of bass season in this part of Georgian Bay… Ross relocated a skunk this morning, then went out and threw his line in. We’ve caught bunches of bass lately and had to let them go because the season wasn’t open yet – so wouldn’t have been surprised if he’d had to wait for one today. But no – one cast, line hit the water and the first largemouth bass of the season was on the line. I haven’t fished yet… went kayaking around the bottom of Hogg’s Bay instead… we’ll go out in the boat in a bit though. It’s nice to have a weekend (mostly) off for a change – at least so far…. Ross is pretty much booked up for the next week, but only had the skunk to deal with this weekend so far. Bonus! But if you do discover pest problems while you’re up at the cottage this lovely Canada Day weekend, do give us a call at 705-534-7863… or better yet, email us at ccpestcontrol@gmail.com – that way it’ll go through to my phone even if you happen to catch us out on the boat. And do have a great Canada Day long weekend. Well, we’ve pretty much finished up the first round of spider sprays – did we miss you? We’re sorry! Give us a call or drop us an email at ccpestcontrol@gmail.com and we will certainly get that done for you – but mostly what we’re dealing with right now are carpenter ants. They are all through cottage country these days – we’re getting calls from all over Simcoe, Tiny & Tay, Port Severn & Honey Harbour. Tiny still seems to be the most impacted though. 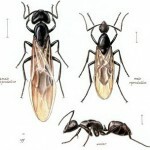 Carpenter ants are, of course, the big ants – and they can do an awful lot of damage, although fortunately they are much slower about it than termites. There are a number of ways to tell that you have them – seeing them, of course… but also you might find piles of a sawdust like material (sometimes coloured, if they’re tunneling through insulation). And if they are really bad, you might hear them as well, crunching in the walls. You do NOT want them crunching through your walls! Give us a call at 705-534-7863 or email us at ccpestcontrol@gmail.com and Ross will be happy to solve your carpenter ant problem by making sure that both the main and satellite nests are eradicated. Finally took it to someone that has a whole lot more artistic ability than I do – Darryl at Midland Copy Shoppe Print & Design Services – and our new banner is what we ended up with. 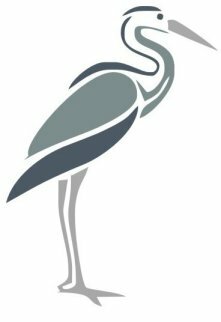 Plus he provided us with a solo heron that we can use for Ross’ avatar and so on, and another design that will work better on clothes and hats and so on. All for a very reasonable price; wish we’d done it at a lot sooner! Carly Robillard, the newest member of the CCPC team. The busy summer season is here again, and Cottage Country Pest Control has hired an extra pair of hands to help take on the task. 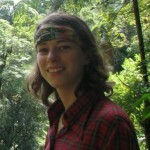 Carly is a Biology graduate with a career background in wildlife education and reptile care. You may have seen her before giving presentations at Awenda Provincial Park or caring for birds of prey at the Wye Marsh. Carly intends to pursue graduate studies in Science Communication, and she loves being able to tell new people about the exciting natural world around them. Until September, she can be found helping Ross with the Spider Sprays and other pest control tasks, and can be heard on the phone with our customers.